What is your identity? Identity is a multifaceted concept rooted in culture, religion, sexual orientation, profession, personal philosophy, social roles in society and many other forces driven by nature and environment. There is no right or wrong answer. How I define myself may change over time and may be different than how others perceive me. I am a faculty member at Rush University College of Nursing. I teach public health, community-based mental health, epidemiology and biostatistics and conduct research to improve the quality of life for people with intellectual/developmental disabilities. I am also a retired noncommissioned officer of the United States Navy, a hospital corpsman, and a 100 percent disabled Gulf War veteran. So what is my identity? Many of us (current and former service members) are still trying to figure this out. I am fortunate to have the support of Rush College of Nursing and Rush University Medical Center embrace me holistically as the complex human I am. Approximately 34,000 U.S. service members will return home from Afghanistan and Iraq during the next year. By some estimates, as many as two million service members will have returned to civilian life by 2016. Some make this transition easily, others not at all. They do not have the luxury of decompressing on a trans-Atlantic voyage as soldiers returning from World War II did. They hop on a plane and come back immediately to the world, though many would argue that with Internet and mobile devices, the world was never more than one click away from the battlefield. I may be a step away from obliteration by an IED in Iraq as I chat with my partner in Chicago while she is holding our child. The soldier and then veteran must find a way to integrate these seemingly divergent counterpoints of experience into a unique, coherent sense of self. These men and women live among us as colleagues, students, and members of the greater community. We can give veterans low-cost mortgages and opportunities for low- or no-interest student loans, we can put up yellow ribbons and assemble honor guards at the funerals of those who only make it home in spirit, but we also must act to afford a sustainable future to the individuals who have made the ultimate sacrifice. As an institution, we at Rush do not stand by when we know we can make a difference. For the past few years I have been privileged to be involved in a growing movement across the nation and in the city of Chicago to support former service members, whether they served in peacetime, conflict or war. Currently, Rush University Medical Center employs over 75 self-identified vets. This year Rush Diversity Week, an annual event sponsored by the Medical Center to celebrate the contributions and differences of everyone who works, studies and teaches at Rush, centered on veterans’ issues. Supported by my college, I joined with senior members of Rush leadership to participate in raising awareness about the unique needs of people who identify with the military culture and served our nation. Spearheaded by a current generalist entry master’s nursing student and Army veteran, we are in the planning stages for the creation of a Veteran’s Forum. It will serve as a hub of services and support for veterans, open to anyone with a question, interest or need. This forum promises to become an invaluable resource for employees, students, family members and the community overall. But much more needs to be done for our returning veterans. Recently, several Rush retired service members were invited by the Chicago Health & Medicine Policy Research Group to participate in a panel presentation on military culture for community health care providers. This program supports the “Joining Forces Initiative,” led by first lady Michelle Obama and Dr. Jill Biden, to improve and expand services including employment, education and wellness for veterans and their families. Rush is collaborating with national organizations to establish a center for veterans with traumatic brain injuries and their families. And now I am embarking on an initiative to help my fellow university faculty members and medical center health care providers better understand our identity. 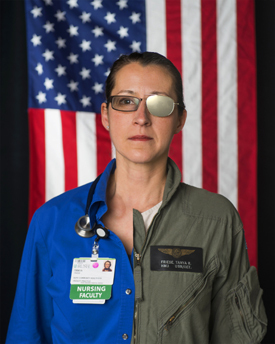 What we can do as health care providers, students and faculty is learn more about the military culture, military identity, and the issues veterans face when they return home. To know that when I address you as “sir” or “ma’am,” I do not dismiss you as an older adult, I am addressing you with respect. To know that when you approach me and I shy away, I am protecting my back, not shutting myself out to what you have to say or rejecting your healing touch. Embrace this diverse group of individuals, their families and friends, so that veterans will know that Nurses CARE and Veterans COUNT. This entry was posted in Nursing, Rush University and tagged Memorial Day, Navy veterans, nursing. Bookmark the permalink. I have such a high repect for military personnel as well as nursing staff. Wonderful story! I am a employee of Rush University Hospital, but I have always felt like the veteran of our country could be treated a whole lot better, It should be nothing that we are not doing for them once they come home, I personally feel like the red carpet should be lay out for people who serve and die for us, So I would like to know what I can do to help. I work in the Radiation Oncology Department, I do know appreciate any and everyone who serve our Country.